Caudo Vineyard | No escape for Adelaide residents this October!! It’s the first day of October and we are in for one huge month at Caudo Vineyard! First week in and already we are gearing up for a long weekend. There is plenty of action happening at the cellar door with a large crowd anticipated. It’s just a taste of what summer is going to be like this year. Bring it on! 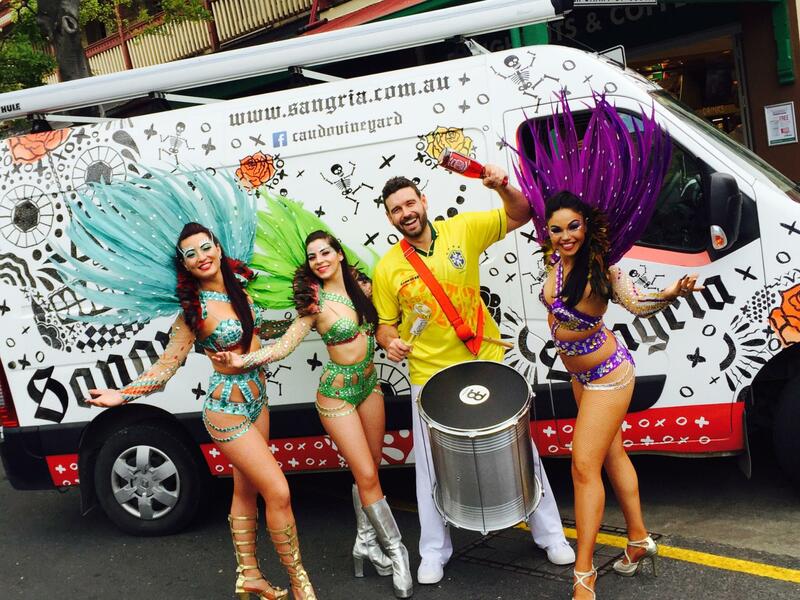 The Master Sangria Van will be travelling hundreds of kilometres across the state to be at a number of events this month. Tonight and tomorrow is your last chance to to do True Grit’s Night Attack at the Adelaide Showgrounds from 6.30pm. Compete over 5km with 17+ Obstacles with lighting, smoke machines, music and lasers and finish to get a free Sangria at the end. Registrations have closed online but you can still register at the event. The Sangria mobile will be serving Sangria and pumping out the beats! Spanish Dancers, Formula 1 cars and Sangria!!! Can this get any better? 180 classic racing cars will be lining Gouger Street, while 6 imported F1 cars worth millions will be driven through the middle. Get down and live the action! Riverland Food and Wine Festival on Saturday the 17th October. Enjoy the best food, wine, cider and beer the Riverland has to offer at Berri riverfront with a day full of live entertainment. We will have the Sangria van pouring out the freshest Sangria for you to enjoy. We have also been busy organising Day of The Dead! We are bringing it back at the end of the month with a great lineup of entertainment, awesome food and of course- plenty of Sangria! More information will be released very soon so save the date. There’s nothing we love more than a jam packed long weekend. We have checked the list to make sure we have everything you need to enjoy a great weekend. Icy cold drinks- tick, tick, tick! Everyone’s moods are on a high, it’s school holidays and the sun will be shining so get outside and enjoy it with your friends and family. Local band The Offshoot are playing both Saturday and Sunday from noon. Listen to live music and sink your teeth into delicious gourmet pizzas, local tasting platters and BBQs for lunch. Footy fans, rest assure, we will have the AFL Grand Final on the TV screen Saturday so you can keep up with the scores. Daylight savings kicks in on Sunday so we will stay open late on Sunday trading to 9pm. The cellar door will be open this Monday and trade as normal throughout next week. Right about now is where you text your girlfriends, mates and partners that you are going to Caudo Vineyard on the weekend. See you there! The weather gods are smiling down on us this weekend. She will be reaching the thirties by Friday and the mercury will keep rising up over the long weekend. UV will be high on Friday and Saturday so ‘slip slop slap’ and take care out in the sun. Also, remember to keep hydrated. This weather is calling for some river action. Now is time to put the boat back in the water and take them family out for a cruise. If you don’t have a boat we recommend giving River Gum Cruises a call. Let James and Sandra take you out on the Murray River in their 10 person boat. They even do day cruises to Caudo Vineyard. Ph. 0477333896. We are super excited to share with you our Sangria Cocktail Recipes!! These five delicious concoctions of Sangria goodness are to die for and are perfect for entertaining, celebrating and just enjoying with your favourite buddies in the summer heat. The Jolly Rumbler is a crowd favourite with its spicy and minty favours mixed into the Red Sangria. It is easy pleasing and simple to make. On another note; The Hogwash Bend 2011 Shiraz is selling fast. At $35 a case how can you go wrong, it’s a steal. It will be available over the long weekend so make space in the car boot. 919 Wines- see traditional Morris dancing at the cellar door in Berri from 10am until 11am on Saturday. No bookings required. The Riverland version of the running of the Bulls- Barmera’s Running of the Sheep. See hundreds of sheep run down the Main Street of Barmera to Monash Oval as they prepare for the annual sheep dog trials. Starts 10.30am Saturday the 3rd. Cobdogla Steam and Irrigation Museum Open day from 9am until 4pm on Sunday 4th. The museum celebrates the history of irrigation, machines and early settler in the region. Loxton’s 96th Annual Spring Show is on this Sunday and Monday. A big day of family fun including rides, entertainment, horses in action, log chopping, craft and cooking entrants. Loxton Oval. Adults $12 entry Children $5. The Fairies come to the Riverland! The popular Australian children’s entertainment “The Fairies” will be at Chaffey Theatre on the 7th of October to sing and dance with all their magical friends. Book tickets through Renmark Chaffey Theatre. As the weather is warming up the fish should be coming on the bite! So get down and chuck a line in with the kids. Erected late 1901 the original windmill was located riverside and was used to irrigate the homestead and garden to sustain the many Rose bushes which flourished there, hence the property was known as “Rose Farm”. In the Flood of 1956 the windmill was seen slashing through water and was lost. In 2000 a replica windmill was re established in the highest point of the vineyard paying homage to the hard laborious years of the early pioneers. The Windmill is now a recognised icon from roadside for the Caudo Vineyard resplendent in its Yellow black and red paint signifying a giant sunflower. It can also been seen in the eyes of the Sangria Skull. We hope to see you this weekend for a big weekend of great food and local entertainment! No bookings required. Pack the deck chairs and picnic rugs as tables are limited.